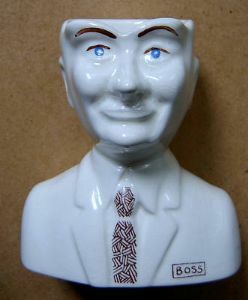 This is one of those quirky releases from CARLTON WARE in the Lustre Pottery series produced from 1976. This egg cup, although now entitled 'The Boss' was thought to have been based on the then Prime Minister, Jim Callaghan (there is a certain likeness) and was intended to have been called 'The bank manager'. It is made of white earthenware and, although in excellent condition, suffers a little with the habitual crazing. There are no chips/nibbles nor restoration work. It measures 3.25 inches (9.5 cms) in height .